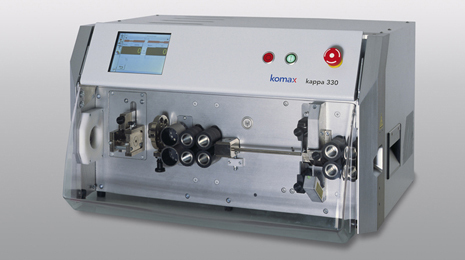 With the new Kappa 330 we can now process cables with a cross section of 0.22mm², to 35mm², multicore conductors with an outside diameter of up to 16mm or flat cables with a width of up to 40mm. The conductor diameter is automatically detected by a sensor using an inductive measuring approach. This feature greatly shortens setup and changeover and reduces operating errors, which overall saves cost. 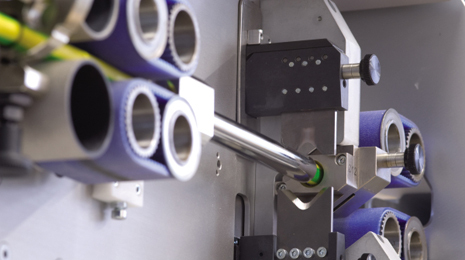 Laser and a CCD line optically measure the outside cable diameter and check that the cable is present during processing, making this one of the most advanced Cut and Stripping Equipment on the market. Outer slitting of the conductor insulation is also now optional, for products that require inner cable connections or circuitry. With a wide range of rollers available, any type conductor can be successfully processed at high speed, no matter what insulation material. Projects24 Development cc. All Rights Reserved.